We have a couple of things today...and they are both Good Things! 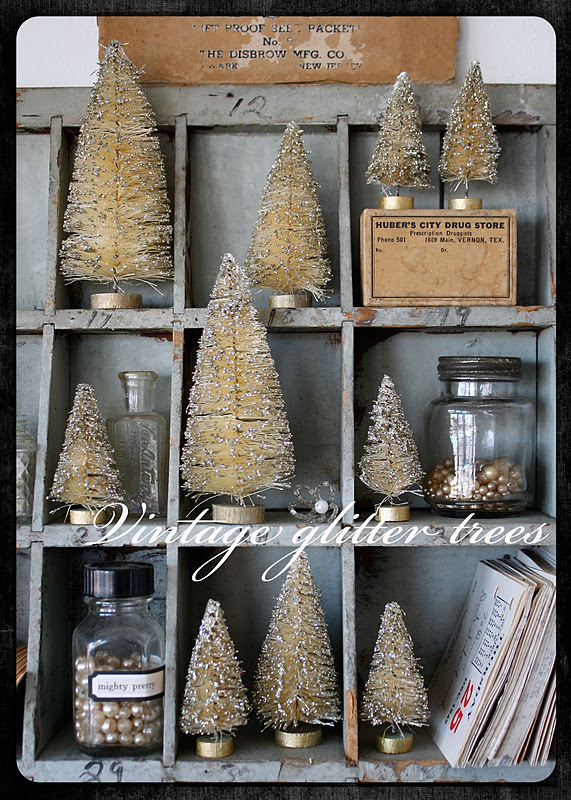 Glittered bottle brush trees to be exact. 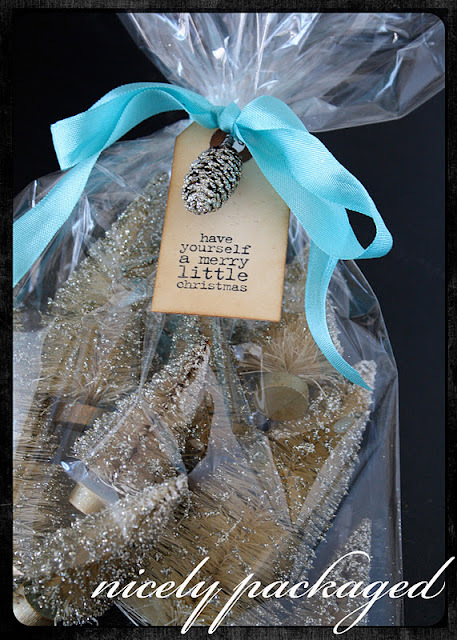 I have hand glittered the last of this years little bottle brush trees and packaged them in groups of 10. Two large, two medium, six small (4 1/2" to 2 1/2"). Each bag of 10 is $12.95 with $3.95 shipping. There are very few packages (like 10) so be quick if you would like some. Email me at paula@2 gypsygirls.com to buy. Sorry the little trees have already sold out. I guess I will need to do more next year! I personally just like looking at this picture. I foresee this picture ending up on Pinterest, don't you? thanks for the inspiration. I just put this on my pinterest winter board. Love LOve LOVe bottle brush trees. 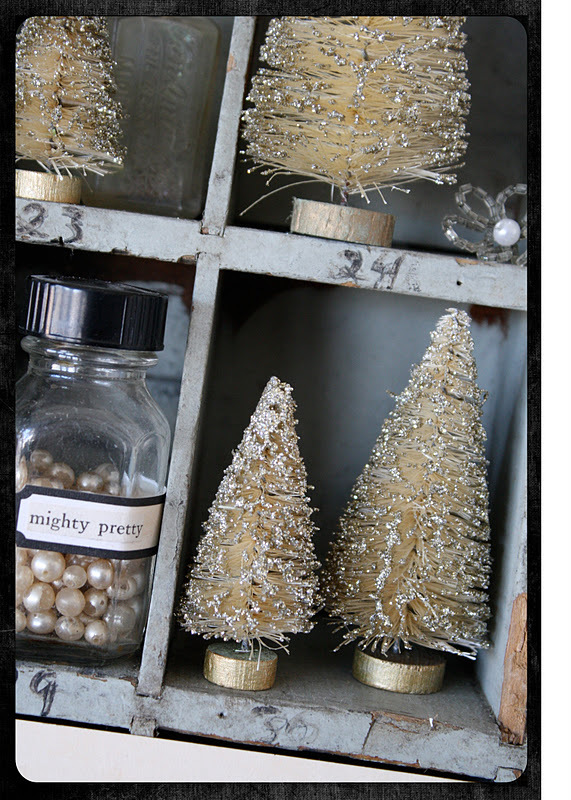 I have a star for the top of my tree that is made from bottle brush trees. It's one of my fav things. Speaking of fav things, I managed to find some 7 gypsie's paper tape-the three pack with the grids yesterday and snapped them right up. I'm a tape junkie. Oh sweet little bottle brush trees! That photo is beautiful. I've recently discovered Pinterest and I'm going crazy Pining images (including from here). These beautiful trees are going to go straight to my gallery. Love them! 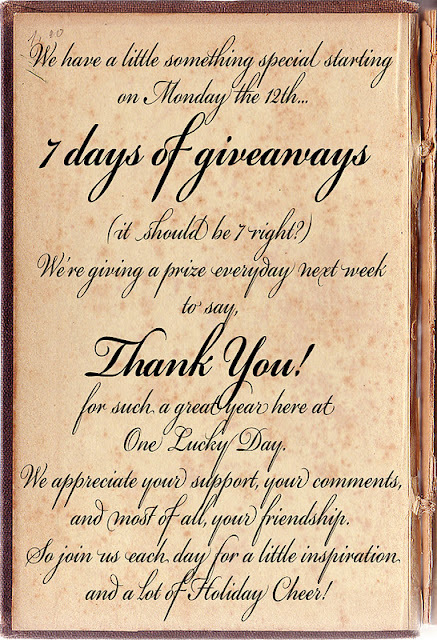 Btw, thanks for the 7 days of giveaways! :-D Merry Christmas! Love, love the trees. I too have saved it on my Pinterest board. Can't wait for the 7 days of giveaways! Ohhh noooooooooo can't believe I'm too late, I would have loved to purchase a bag of your gorgeous trees! I absolutely adore your picture and had to pin it on my Pinterest White vintage Christmas inspiration board right away! Ohhh...love a giveaway! Wish I'da gotten in on the trees. Dang it! Cute little trees! And the giveaways sound like fun. Those bottle brush trees are adorable. I only wish I had an imagination to come up with something like that! Too cute! Pinned these beauties right away. Sigh... I sure hope one of your 12 days of give-aways includes a day with you! Oh My! Thank You for the Gorgeous Inspiration! Absolutely Stunning Vignettes! Thank You for Sharing! I just love all of your clever ideas! You make everything look so beautiful. The gift wrapping and gift card pocket are among my favorites. Thanks for the inspiration! you're a constant source of inspiration - love your creative ideas - and your road trip reports....! soooo pretty. will these be in your etsy shop? how can i order these from you? love, love, love! I am crying big tears because I missed the trees. They are darling and I love the display. Oh Poo! A day late! They're adorable!!! Now following your GORGEOUS blog! Come visit me sometime!